A 3/4 full 5,413 gallon pot, 6,600lb's of Chicken, 4,400lb's of beef and tons of vegetables. Capable of feeding between 60,000 - 70,000 people, I'd say this qualifies as a Supersized Meal! The so-called "Bolivarian stew" was a play on the name of Chavez's socialist movement, named in honor of South American independence hero Simon Bolivar. Let's celebrate! CARACAS, Venezuela - Venezuelan officials claimed a world record Saturday for making the largest pot of soup, a giant cauldron of stew prepared by President Hugo Chavez's government. 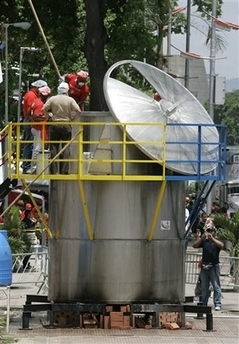 The hulking stainless steel cooking pot, set up outdoors in downtown Caracas, contained about 3,960 gallons of "sancocho" stew, Food Minister Rafael Oropeza said. That would dwarf the current record-holder listed on the Guinness World Records Web site, a pot of 1,413 gallons of spicy soup prepared in Durango, Mexico, in July. Oropeza called it "Bolivarian stew" â€” a play on the name of Chavez's socialist movement, named in honor of South American independence hero Simon Bolivar. He said it was enough to feed 60,000 to 70,000 people. Workers stood on raised platforms stirring the soup with poles, and then dished out servings to a crowd at a state-run market. It contained 6,600 pounds of chicken, 4,400 pounds of beef and tons of vegetables. Addressing reporters next to the pot, Oropeza said the government is solving supply problems that have made it difficult for Venezuelans to find staples like milk and eggs in recent months. He said the state-run market had ample reserves of all products. With price controls in place, rising demand has outstripped domestic production of some foods, prompting an increase in imports. Oropeza said the only product that remains in short supply is milk, a situation he blamed on a "world problem" of unusual cold snaps and dry spells hurting milk production. As for the soup, he introduced a representative of Guinness World Records who he said was on hand to certify the record. The 5,413-gallon pot was about three-quarters full. "We didn't add more for security reasons," Oropeza said. "There's plenty for second helpings."